Android 9 Pie is released today and you must be wondering when your Android phone will get the Android Pie update? Well, the fact is, only a handful of Android devices will be updated to Android Pie (Android 9) from their respective manufacturers. The thumb rule is most of the Android phones get the latest Android version for 2 next major releases. Exceptionally only few manufacturers update their phones to the latest Android beyond two years mark like OnePlus, Xiaomi etc. But there are some other options available to update an Android phone beyond official updates! 2 What Android Pie Download options are available?? If your phone is an older one (may be two years old or more), there is a chance that it won’t get the Android 9 update from the phone’s manufacturer. But that’s just NOT the official update, uh huh! There comes the custom ROM such as LineageOS, AOSP ROM, AICP ROM, crDroid ROM, Resurrection Remix ROM, OmniROM etc. which can still bring the latest Android for your Android phone. If you see the Lineage OS 15.1 ROMs list which is based on Android Oreo, then you can see there are so many outdated phones such as OnePlus One, Nexus 4, Zuk Z1 etc. have still got the Android Oreo update. What Android Pie Download options are available?? Based on the availability of an Android Pie ROM, I will add more ROMs in this list. As always any custom ROM does not come with pre-installed GApps (Google Applications) because of Copyright issues. So, you need an extra Oreo 9 GApps (such as Open GApps, MindTheGapps etc.) to be installed via a custom recovery like TWRP recovery. Also, mostly none of the Android Pie ROM come with built-in ROOT binary, hence you need to install the supersu ROOT binary after installing the Android Pie (Android 9) ROM. Well, the ROOT binary is optional unless you really want to ROOT your Android Phone. In addition, almost all of the Android phones come with bootloader locked and a stock Android recovery. NOTE: If you are installing an OFFICIAL Android Pie update released from an OEM then you don’t need any of the above stuff. 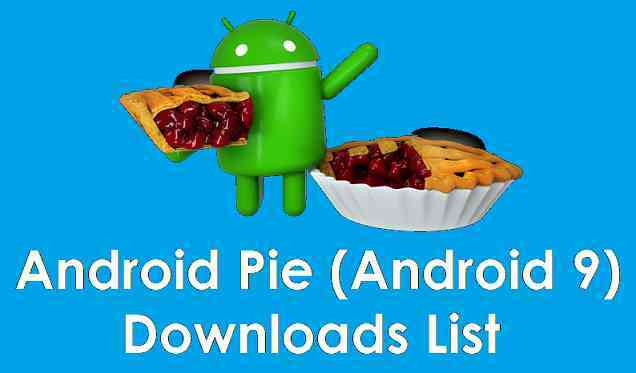 Below are the Android Pie download link for available Android Phones. These Android Pie update links may lead to an OEM released OFFICIAL link or it could be a custom ROM based on Android 9 (Android Pie). Most of the links in the above list are dead at this moment. Links will be active the moment any Android Pie Download is available for some device of an OEM. If your device is neither in the below Android Pie update list nor on any ROMs list, then you can still try other legacy ROM updates such as an Android Oreo ROM or an Android Nougat ROM. POZTOVANJE, (USEFUL GOOGLE TRANSLATOR) PLEASE HELP YOU. Now, the MASTER has changed the phone number for this phone (ACER LIQUID JADE S55.) WHEN THE PHONE LIST OF THE PHONE OF THE SOURCE WAS BEGINED WHEN A FABRIC LICENSE WAS, I WANT TO IMPROVE THIS PHONE, AS WELL THAT MORE POSSIBLE, BUILD. I SAY ON THE CYANOGENMODE SITE – IN, BUT I DO NOT HOW IT DO IT WITHOUT COMPUTERS, I DO NOT HAVE A COMPUTER. THE REMEMBER WHICH IS THE BEST FOR MY TELEPHONE. I NEED A DETAILED INSTRUCTION, STEP BY STEP, IS IT IS I HAVE STARTED, HOW TO INSTALL THE BEST ROM. THE WORD OF THIS IS AND WHAT I NEED THEIR LANGUAGES IN THE SYSTEM SETTING, CROATIAN, SERBIAN, CZECH REPUBLIC AND SLOVAKIA. IF IT IS NEEDED TO TAKE SOME APPLICATIONS FOR THAT, INSTALLING THERE IN THIS PROCEDURE, I NEED THEM YES SELECT. GOOD WITH ALL YOU, AMEN. Added AOSP based Android Pie for Honor View 10 and OnePlus X.
Por favor intenta sacar una basada en android 5, 6, 7, 8 o 9 la que quieras y puedas para ZTE Blade apex 2 de digitel el 4.4.2 da mucho rollo ya lo he revivido dos veces de chiripita… lo tengo liberado de bootloader, twrp, y pienso rootearlo pero cuando consiga una rom por ello yo y muchos mas que están igual te agradeceríamos de corazón…. Please try to get one based on android 5, 6, 7, 8 or 9 the one you want and you can for ZTE Blade apex 2 of digitel 4.4.2 gives a lot of roll and I’ve revived it twice of chiripita … I have it released from bootloader , twrp, and I plan to root it but when I get a rom for it, I and many more that are the same, we would appreciate you from the heart ….